Do you have an unsolved problem with your spouse, one that has left you feeling perpetually resentful, mistreated, or hopeless? Perhaps your partner does things that are hurtful, unfair, inconsiderate, insulting, annoying, or completely outrageous. It has become impossible to discuss the situation, because he or she immediately gets defensive, refuses to listen, takes a completely illogical approach, or blames you. If this sounds familiar, you probably have a perpetual problem. Dr. John Gottman's research tells us that most couples have at least one perpetual problem. To an outsider, some of these problems may seem trivial, or they may appear to have obvious solutions. But in the context of the relationship they cannot be solved because there is a deeper meaning for each person. Perpetual problems represent fundamental differences in personality or values. Perpetual problems often lead to a stalemate in which both people refuse to budge and may even become more extreme in their positions. Each sees the other as unreasonable, perhaps even malicious or crazy. They distance themselves from each other and the relationship falls apart. However, this scenario is not the only possibility. Many couples manage to work with their perpetual problems and remain happy in the relationship. They have acknowledged that the problem is not likely to go away, but they can examine it without attacking each other. There doesn't have to be a winner or a loser. The first step to handling a perpetual problem is to understand its cause. Problems like this usually represent what Gottman calls dreams, the hopes and goals that are part of your core personality and that help make your life meaningful. For example, money is often a very sensitive issue in relationships. It's not unusual to hear X accuse Y of being a cheapskate, while Y accuses X of being a spendthrift. 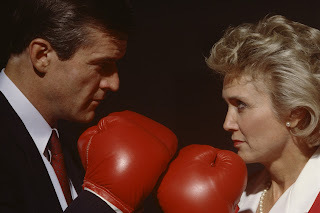 Money fights have become the main theme of their marriage, and each thinks the other is completely unreasonable. Neither one knows what is really behind the other's position. What this couple can do is sit down for an honest, non-judgmental conversation in which each one gets a turn to speak sincerely about what this issue means. While one person is speaking, the listener can ask questions in order to get more clarity, always remembering not to argue or criticize. In an emotionally safe environment, they will discover the real meaning behind the money arguments. Y's father was an alcoholic who couldn't hold down a job. What little money he made was spent on drinking, or on impulsively-purchased luxury items, rather than on food and other necessities. The family lost their home to foreclosure. They had no savings, no insurance. Y's mother worked at menial jobs, and Y dropped out of school in order to help. They never had enough money to deal with emergencies and had to accept help from judgmental relatives. Y vowed never to be in that situation again. For Y, living a frugal life and building up a savings account creates an all-important sense of security. Any unnecessary spending threatens that security. X grew up in a home where the constant refrain was "We can't afford it." Both parents were reluctant to spend money, and any expenditure beyond the bare necessities required a great deal of analysis and negotiation. They never ate out, and family vacations were low-budget car trips with everyone crowded into a cheap motel room at night. X was ashamed of their old car and second-hand clothes, and felt dejected over not being able to afford activities with classmates. For X, having enough money to spend on life's comforts and pleasures is a sign of success and triumph over hardship. When X and Y reveal their dreams, they can see that this is an issue that has a deeper meaning for each of them. They can now recognize and respect each other's dream. X is never going to give up the need to spend money on fun and luxury. Y is never going be comfortable without building a large, secure nest egg. But with understanding and respect they can look for common ground and find ways to experiment with temporary compromises. They may never find the perfect solution, but it is possible that they can gradually make adjustments that allow them to build a new dream together.